Bread: the staff of life. And one of the first words you need to learn in a foreign language, right? 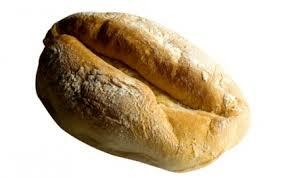 Well in Portuguese it's 'pão'. Now you're sorted. But wait a minute. If pão is bread, what is this stuff called 'papo seco' that everyone is asking for? Well that's bread too. It's the roll you see everywhere for breakfast lunch and dinner, eaten with jam and butter, sardine paste, or cheese and olives. So now you've cracked it. You know all about bread. But hang on: what's this served with your soup? A really heavy, dark bread. 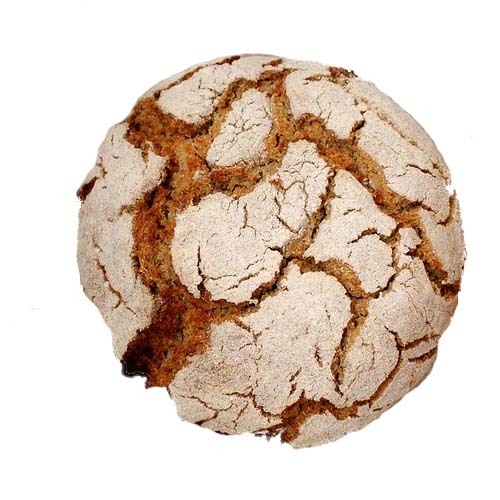 Well that's 'broa', made from maize and/or rye flour as well as a little wheat flour. 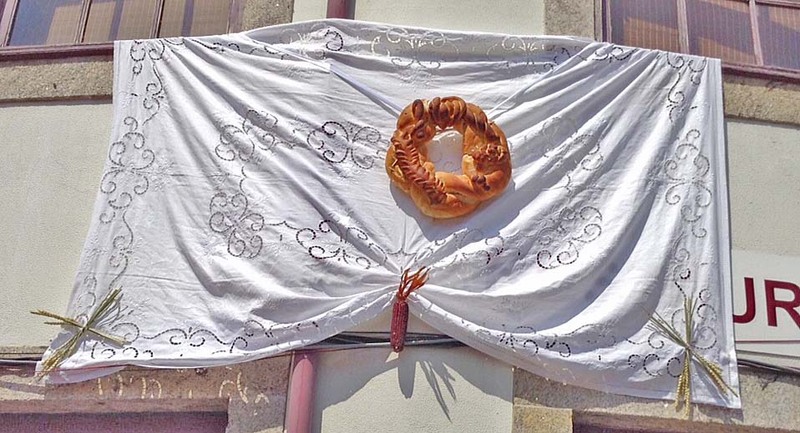 To see more of this new bread, what our host called a traditional local party, and the curious story of the banishment of the bakers from Oporto, click here. That's it then: pão, papo seco and broa – who needs more words? Well, as it happens I needed more words when we got to Valongo rather too early to check in with our host, who hadn't yet got home from work in Oporto. 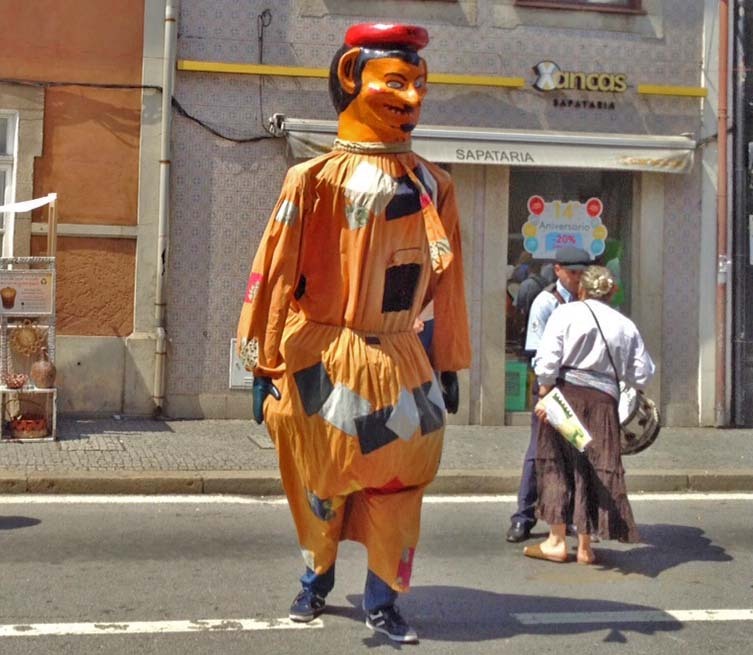 With time to kill we decided to loaf around town for an hour or so and, with the serendipity that so often strikes in Portugal, came upon a local festival, the 'Festa da Regueifa e do Biscoito'. Biscoito we can all guess but regueifa? What on earth is that? Well you've guessed; it's bread, of course! In Valongo this June, the regueifa was celebrated in every shop and café, in street stalls and high above office doors. It was often displayed on heirloom tablecloths stitched and crocheted by long gone fore-mothers and grandmothers. Most of the breads were rings with a hole in the middle, like a polo mint. Almost all were decorated with squiggles, shapes and plaits of dough but some were more imaginative still. In the locksmith's window, for example, the regueifa was in the shape of an enormous key. A market stall had one that was either a lizard or a crocodile. Let's have a closer look at a couple of regueifas. Now, you may be asking yourself, "Why is Valongo is so enthusiastic about bread?" Well, so the story goes, an early king decided that bakeries were a fire risk in Oporto, the bustling business city, and banished them to nearby towns. (This is not so daft as it may seem. After all, the 1666 great fire of London started in a bakery.) The makers of wheat bread and biscuits were sent to Valongo: the broa makers were banished to Avintes. Though Oporto, of course, now has bakers of its own, reducing the need to import bread from outside, bread making remains big business in both towns. - the bakers of Avintes think the king who did this was Dom Dinis b. 1261 d. 1325. Dom DInis, popularly known by the nickname, 'o Lavrador' – the farmer – was keenly interested in rural development, civil society, exports.... 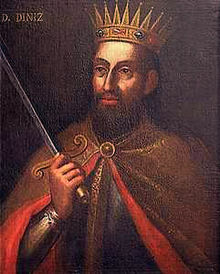 In fact he was an all-round good king. You might then imagine this story to be true, the only problem being that no one knew about maize until the discovery of the Americas, which wasn't until 1492. 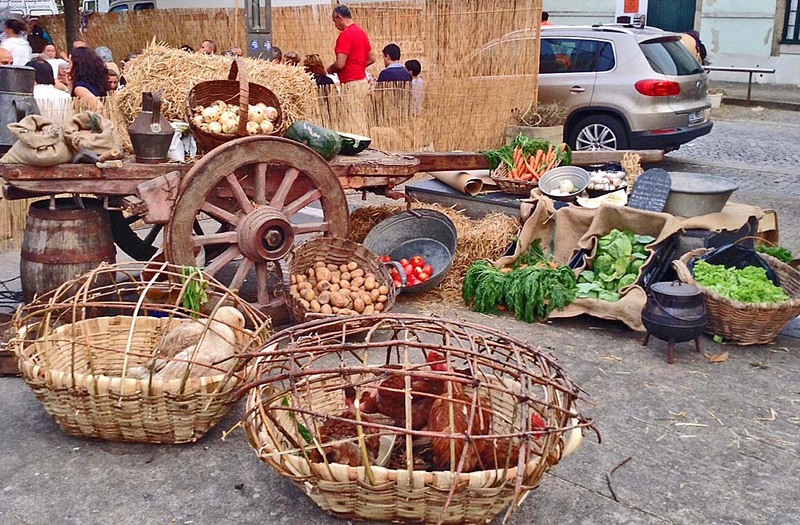 Maybe broa was only made with rye in Dom Dinis' time. Maybe folk memory is mistaken. Whatever the case, in Valongo celebrating the regueifa and dozens of different biscuits is a good excuse for a general knees-up and lots of fun. 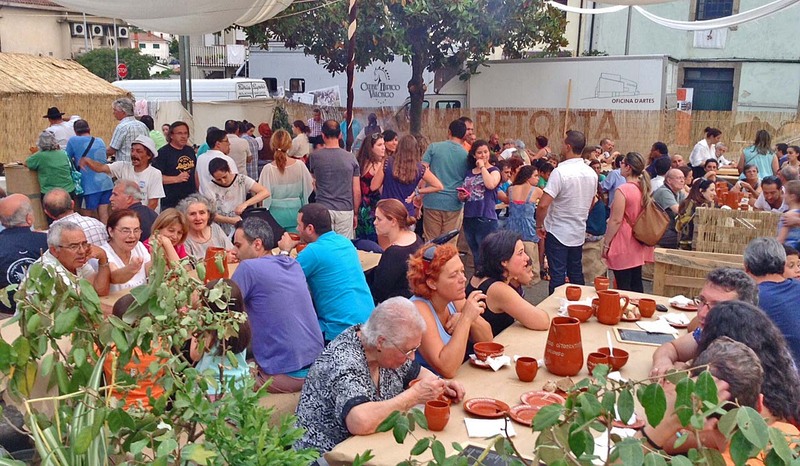 There were big papier maché dolls dancing to a band in the streets, stage music in the evening, stalls selling local produce, street food - in fact, a general big town party. I love these local festivals. Not only do they bring some fun into lives that for the last few years have been a grind of austerity and unemployment; they hold communities together. At times the EU has found fault with Portugal for having too many holidays but these holidays have always had a purpose which should be celebrated. They are for solidarity, for sharing whether of food, friendship or culture. They link the past to the present and look forward to the future. So "Long live the regueifa!" say I ... and those moreish, cinnamon flavoured, crisp, little biscuits I'm not supposed to eat!